Invigorate table arrangements with a flavor infusion. Farmers-market greenery, like oregano, basil, and tarragon, gives a modern setting an organic feel; planted in sleek pots, the herbs double as inventive displays for a wraparound menu of foods that put the plants’ virtues to good use. Encourage loved ones to dig in-literally. For cute place settings that will grow and grow on your guests, fill tiny packets of seeds of your favorite flower, and stitch them onto simply printed seating cards; then watch their happiness blossom. “A host, of golden daffodils / beside the lake, beneath the trees / fluttering and dancing in the breeze.” We love daffodils as much as William Wordsworth did-they herald spring’s arrival. 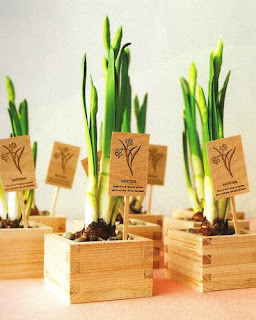 Try budding bulbs bought form a local nursery and nestle into sake cups beneath beds of rocks. 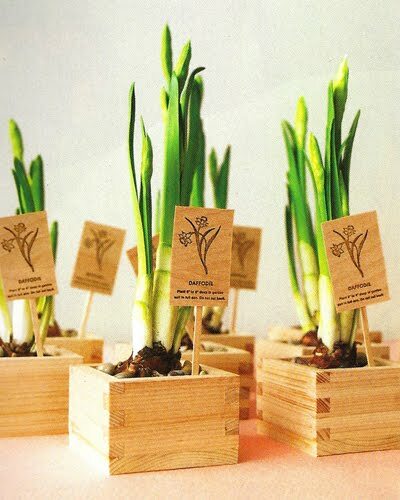 To turn into take-home favors, use a rubber stamp to imprint planting instructions onto wooden posts. If you prefer dormant bulbs, buy them online in the fall.